It is great to dip into The Classical Tradition edited by Anthony Grafton, Glenn W. Most and Salvatore Settis published by Harvard University Press and to which I devote an article to in the most recent Connor Court Quarterly. It is a fascinating read on not just the classical world but also the way that the classical world became part of Western Civilisation. I discovered the work of Anthony Grafton in 2011. He is the expert on Joseph Scaliger and his collection of essays Worlds Made by Words (Harvard University Press, 2009) is superb. I would also recommend Christian Smith’s various books on contemporary Christianity in America, including his most recent study Lost in Transition: The Dark Side of Emerging Adulthood,(Oxford University Press, 2011). It tells a us lot about the values of the younger generation. 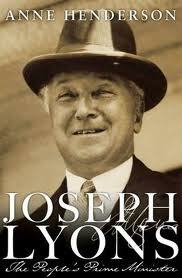 Returning to Australia, I would definitely recommend Anne Henderson’s study Joseph Lyons: The People’s Prime Minister, (NewSouth, 2011) which rehabilitates one of Australia’s most important Prime Ministers.